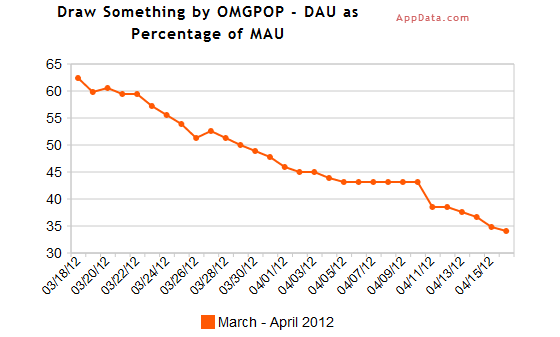 A few days ago, we already reported that DrawSomething was losing popularity in the Netherlands. Now, it turns out the amount of daily active drawers is declining on a larger level as well. AppData (records Facebook logins in apps) recorded a decline in the use of the Facebook functionality, though the app is still highly popular and gaining new users. This entry was posted on Tuesday, April 17th, 2012 at 11:50 am	and is filed under Analysis & Editorial. You can follow any responses to this entry through the RSS 2.0 feed. You can leave a response, or trackback from your own site.